I think it was 2010 or so when Nita's Mom, Lisa, first reached out about a portrait. 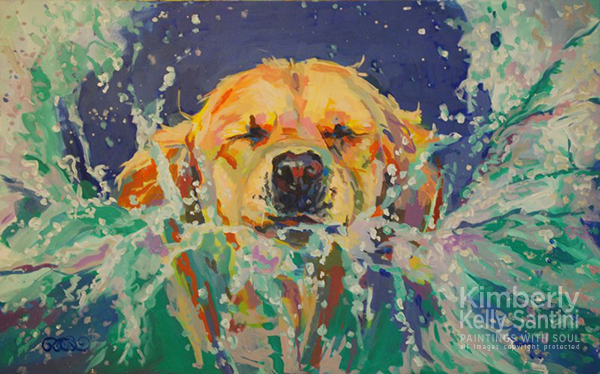 Her dogs were goofy, grinning Golden Retrievers, and Lisa wanted a painting that reflected their huge personalities. A professional photographer, she had documented their life adventures in photos (I was gobsmacked! ), so she wanted paintings that were more than a mere likeness. Lisa gave me artistic license to take the portraits to the next level. She was speaking my language! Nita's first portrait led to another. Then another. I have seriously lost track over how many times her dogs/photos have inspired a painting (I'm sorry, Lisa!). It is always a joy to work together - a photo inspires a concept that I share with her, then more photos follow and my brain explodes while she laughs at me. Lisa has become a sister to me, and I am forever grateful for that. You can see Lisa's photography here. And you can order prints and other goodies featuring Nita (and Bear, her partner in crime) here. Now go do something today that scares you, just a little, like your first cannonball into water over your head.